FGFA – what sort of plane is it? "The Indian military is strengthening its forces in preparation to fight a limited conflict along the disputed border and is working to balance Chinese power projection in the Indian Ocean," James Clapper, the U.S. director of national intelligence, told a Senate committee last week. "Over the last couple of years, the Chinese have been acting more and more aggressively in the political, diplomatic and military arena," said retired brigadier Gurmeet Kanwal, director of the Indian army-funded Centre for Land Warfare Studies in New Delhi. "Of late, there has been a realization [in India] that China is the real danger of the future," Kanwal said. 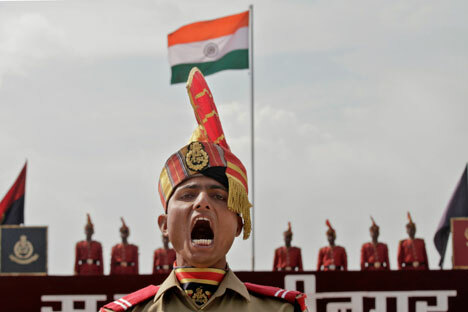 But Zhao Gancheng, a South Asian expert from the Shanghai Institute of Foreign Studies, said India's reasons for building up its military go well beyond China. "Of course, India takes a cautious attitude against China due to some unsettled historical issues. But I still believe India's fundamental goal of developing its military ability is to become a globally big country," Zhao said. "Next, it wants to make certain preparations for so-called potential threats coming from China and other countries." From China's perspective, India's military buildup is "not a main factor" in its defense plans, Zhao said. "Not many people in China regard India as a threat, and China has no intention to take part in a military contest with India," he said. The drive to modernize Indian forces was long overdue, as much of its equipment was obsolete Soviet-era weapons, and the orders for fighter jets, naval frigates, helicopters and armaments have made India the world's largest importer of arms. The Stockholm International Peace Research Institute said India accounted for 9 percent of all the world's weapons imports in 2010, the latest year for which figures were available. Last week's order of 126 combat aircraft, won by France's Dassault, followed a bitter battle by global jet manufacturers. The initial cost for the fighter jets is estimated at $11 billion, but on-board weaponry, technology transfers, maintenance, warranties and other costs are expected to almost double the price. A proposal for a mountain strike corps is awaiting clearance by India's cabinet, and an independent armored brigade for the mountain region also is in the works. India hopes to show that it can strike deep beyond its neighbor's borders to serve as a deterrent for any Chinese aggression, Kanwal said.